Not as juvenile as expected but also not as great as raved. The one missing thing throughout the show is the "spark" between the characters/cast. 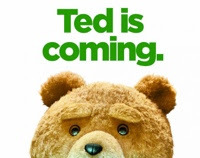 Cute, interesting concept, and Ted was quite amazingly animated, but Mark Wahlberg and Mila Kunis lacked chemistry, Wahlberg's acting opposite Ted was "stoned" (perhaps a nod to the character hinself? Heh). All these led to a climax that could have hit an emotional home run, but instead ended up flatlining. That said, the scenes with Ted himself/itself were genuinely funny. It's saying something when the funniest scenes were the one with guest stars (*spoiler* NJ and RR). Maybe there was some editing and censorship which resulted in this really-not-that-funny-and-I-dunno-why-everybody-loved-it film here. Won't surprise me.